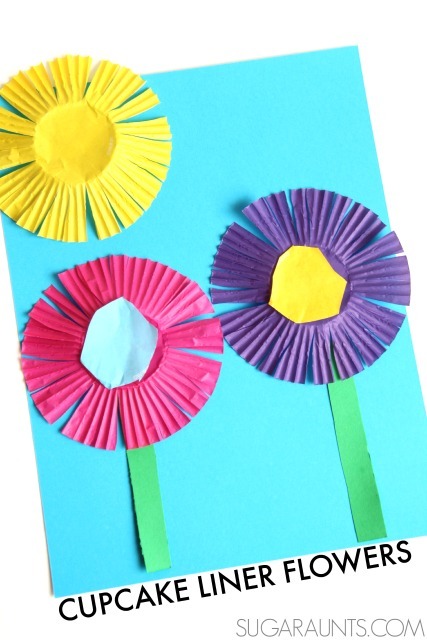 This Scissor skills Easter activity is a creative way to work on scissor skills this time of year. 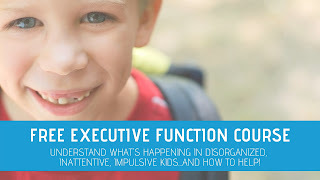 Using a few items you might have in the Spring storage bin, kids can address skills like bilateral coordination, graded precision with scissor control, and eye-hand coordination. 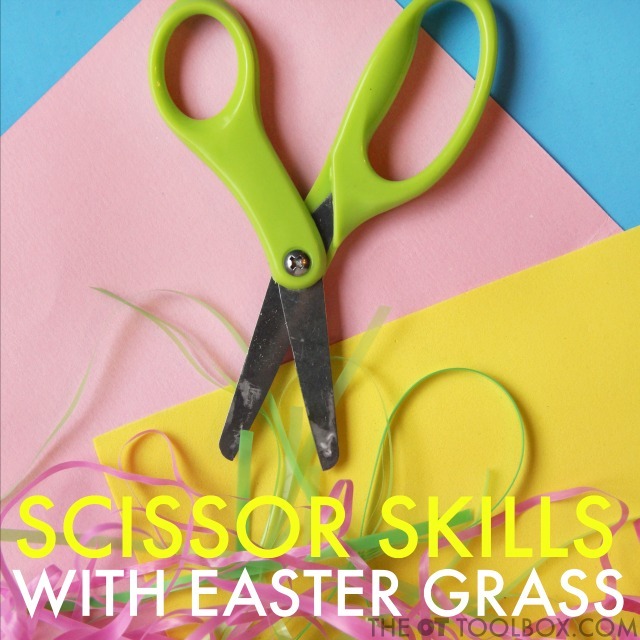 We used a plastic Easter egg and Easter grass (the kind that is used to fill Easter baskets) to work on basic scissor skills like opening and shutting the scissors and using the non-dominant helper hand in a fun cutting activity. 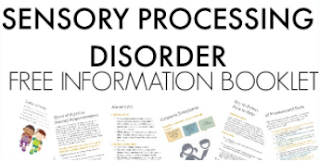 A scissor activity that is easy to create is a great activity for the Occupational Therapist's therapy toolkit. We used plastic Easter eggs from our Easter supply bin to hold a long strand of Easter grass. Both of these items can be found at your dollar store, making this a frugal way to address scissor skills. 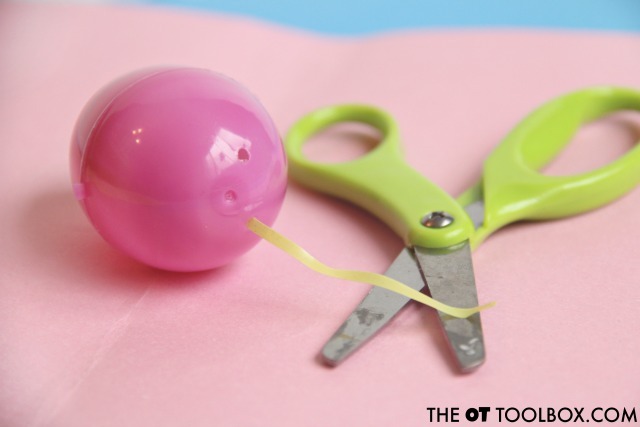 To create this Easter themed scissor activity, open up the plastic egg. Then, place a long strand of Easter grass in the egg and thread one end of the grass through the hole in the egg. Most plastic Easter eggs have a small hole in one end. 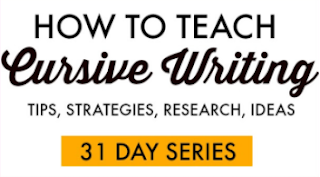 If your's doesn't, then this activity won't work. Simply look for an egg with the hole in one end of the plastic egg. And that's it! 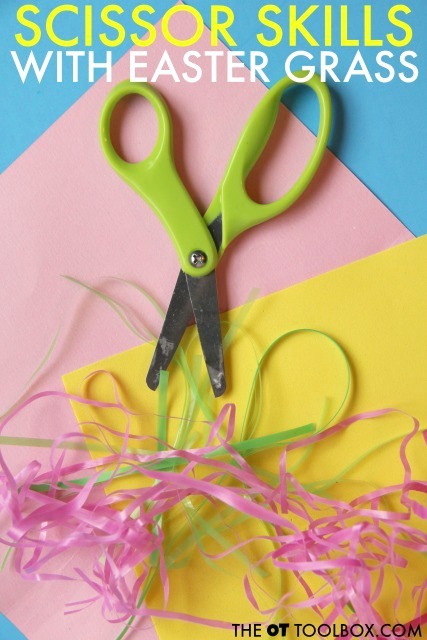 You now have an Easter-themed scissor activity ready for practicing basic scissor skills. Kids can hold the egg in one hand and the scissors in their dominant hand. They can pull out the Easter grass through the egg and work on cutting bits of the grass. 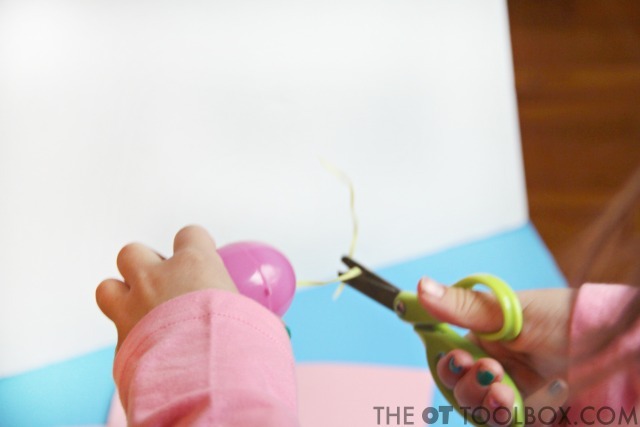 With a small piece of Easter grass sticking out of the egg, kids can address precision grasp and release when using scissors during cutting tasks. The egg makes a great grasping tool for younger kids. 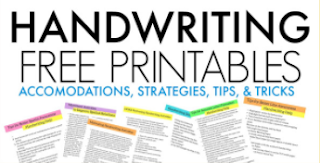 While use of scissors requires children to hold onto and manipulate paper with their non-dominant hand, holding the egg promotes a power grasp with arch development during this cutting with scissors. Pulling the strand of grass out of the egg is a nice way to work on neat pincer grasp and threading more into the plastic egg's hole is an excellent way to encourage fine motor development.